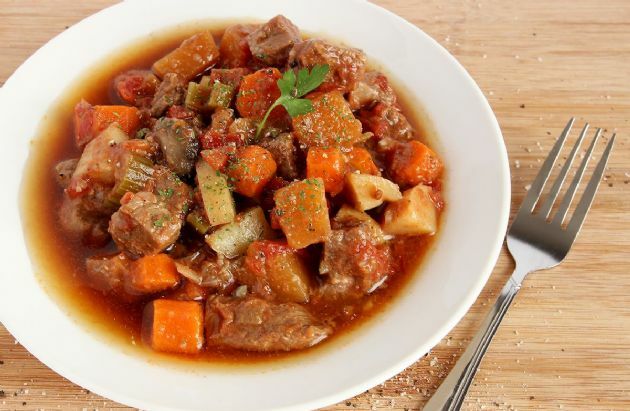 At just 260 calories per serving, this hearty stew will carry you straight through the winter months! At just 260 calories per serving, this hearty stew will carry you straight through the winter months! Mix flour with salt and pepper in a large ziploc bag, or plastic bowl with lid. Cut stewing beef into 1" cubes and then toss in flour mixture. Shake to coat. Add oil to non-stick skillet and then add beef and flour mixture (including any excess flour). Brown beef then add onion and garlic. Cook until onion is soft. Place beef, garlic and onion mixture in bottom of slow cooker with the rosemary and thyme and let cook on low until meat is tender. Then add potatoes carrots, celery, water, soup mix, bouillon and Worcestershire sauce. Cook on high for 2-1/2 hours, and then turn down to low for 2 more hours. If you have a little more time to spare cook on low for 6-8 hours, or until potatoes and carrots are tender. No extra thickening of the beef stew gravy should be required. It turns out perfectly for me every time.